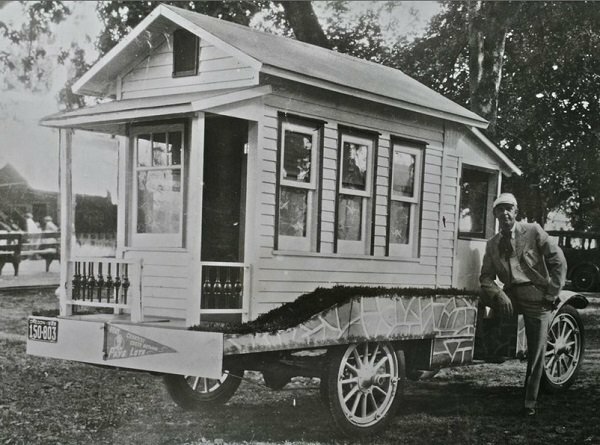 Tumbleweed Tiny Houses has received word that we’re not quite the first house on wheels. Today we learned about Charles Miller, who built and parked his very own Model-T home in Odgen, UT. This 1929 cottage-to-go is a stunner! In this classic farm cottage, we appreciate the roof line, finished porch, well-proportioned front door and over-sized windows. This archetypal home resided right on Mr. Miller’s lawn, parked close to his larger homestead. While Miller’s cottage looks terrific, it might not be ready to withstand the rigors of travel. The Model T trailer foundation seems too light for the load, and its engine horsepower would be severely tested. Once underway, imagine hitting a windy storm and losing this beauty! Away from home, the lack of amenities would be noticed. Mr. Miller lived in the City of Ogden, and within a short drive to Utah’s high deserts and mountains. Without plumbing, water, power or alternative sources, the cottage provided shelter without some of the comforts of home. Yet we can overlook construction matters and appreciate this stylish house on wheels. Here’s to Charles Miller, a man ahead of his time!